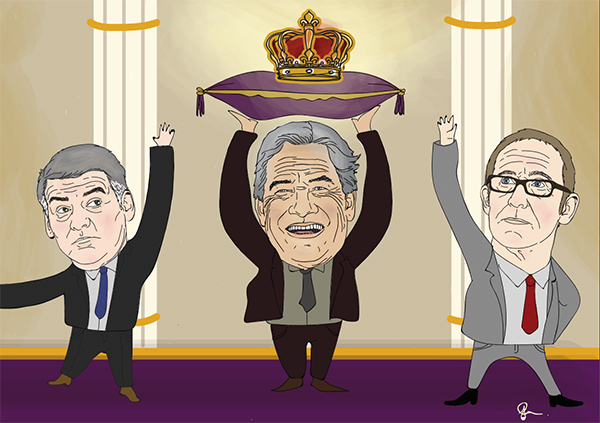 So, Winston Peters could be Kingmaker. It’s a familiar call ahead of New Zealand’s MMP elections. For the previous three, this didn’t come to pass. It didn’t stop us saying it though. And we’re saying it again now. Radio NZ’s latest poll of polls  shows that, based on party votes, both National and the Labour/Greens group may need Peters to be able to form a government. Peters’ New Zealand First was sitting on 8.7% of the vote. National was on 45.7% and Labour/Greens on 41.9% (30.6%/11.3%). There is still a chance for National to go again with current partners Maori, ACT and United Future. That’s if the Maori/Mana voting alliance wins out against Labour’s candidates, and if Bill English’s cups of tea with David Seymour and Peter Dunne go to plan in Epsom and Ohariu. But let’s assume National’s vote continues to slip as the election approaches, and Labour’s Maori MPs manage to pull one out of the bag. And let’s assume at least some of that lost National vote goes to NZF. Peters will be in the box seat. The big question is, who is he more likely to go with? Bill English has made no secret of the door being open for if Peters decides to support National after the election. He’s pretty much offered up a whole tree worth of olive branches in the House in recent weeks, trying to bring Peters round on his new Superannuation policy. The two have worked together before – as Treasurer and Minister of Health during the 1990s, with English taking on Peters' Treasurer role in 1999 after a brief interlude by Bill Birch. They’ve even been known to cast their memories back together to that period during Question Time and at Finance and Expenditure Committee appearances by English over the last few terms. But how much power will Peters and Shane Jones be able to wield at such a vastly experienced Cabinet table, headed by a Prime Minister who knows how to deal with him? Add into the mix that there isn’t much policy overlap (yet) and it looks like this combination would result in fewer big, free-kick wins for Peters on the policy front. It would require the most behind-the-scenes work. It would require proper negotiations on which NZ First policy’s would be taken on by a National-NZF government. So my pick is that he’ll lean towards the Labour/Greens alliance first of all. Peters will be the most experienced member at that table by a long, long way. Most of the Labour MPs who have previous cabinet experience have either left Parliament or are leaving. The ones who remain won’t have much power anyway. (Ruth Dyson, Nanaia Mahuta, David Parker, Damien O’Connor and Trevor Mallard, who would be Speaker). Andrew Little hasn’t even led the opposition for a full Parliamentary term. One of the Green party co-leaders has only just taken on the role. Cabinet positions aside, the coalition negotiations regarding policy shouldn’t be too tough. All three parties look pretty similar on monetary policy, overseas investment, migration policy, transport, superannuation and state-led house building. These topics are going to dominate the election campaign (bar monetary policy, unfortunately – apart from on Interest.co.nz). Labour and the Greens should be fine saving a few wins for NZF if it means quiet support on other issues like the environment. Give NZF its free-to-air sport call and watch them sit back happy. Andrew Little even looks like a Winston-in-waiting. His refusal to consider the Super age rising in 20 years’ time is going to be much more of a hit with current gold card holders than younger voters, irrational as this may sound. Labour is currently working through an old-age housing-related policy with Grey Power. They are trying to appeal to Peters’ base. Yes, to try and take some of his votes, but this will also show they can look at the same issues in the same ways as NZF. There’s a sense in the party that Peters isn’t having a go at them as much as he has in the past. And he’s said to get on well with Green Party co-leader Metiria Turei. Peters isn’t going to let on which way he might go. There is also the possibility that he sits on the cross benches and demands whatever policy National or Labour want to pass must first go through him. But if he is to get into bed with one of the major blocks, the easiest road will be for him to turn left and rule the roost.